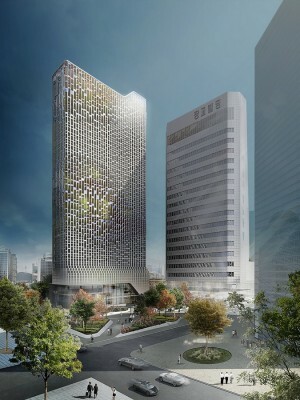 UNStudio’s design has been selected as the winning entry in the competition for the remodelling of the Hanwha Headquarters building in Seoul. 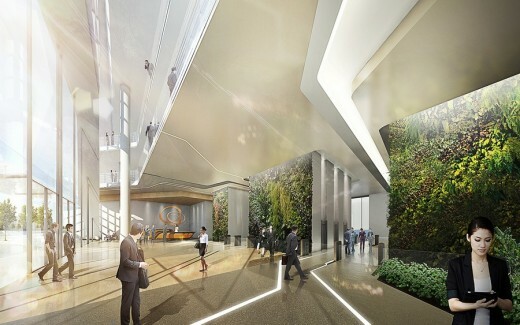 The renovation of the office tower incorporates the remodelling of the facade, the interior of the common spaces, lobbies, meeting levels, auditorium and executive areas, along with the redesign of the landscaping. Located on the Cheonggyecheon in Seoul, the 57,696 m2 headquarter building was seen to no longer reflect Hanwha as one of the leading environmental technology providers in the world. 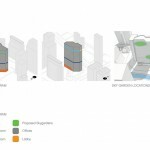 For the competition to remodel the tower UNStudio teamed with Arup (sustainability and facade consultant) and Loos van Vliet (landscape designer). Following the selection of the competition design, agLicht joined as lighting consultant for the interior, landscape and facade lighting. 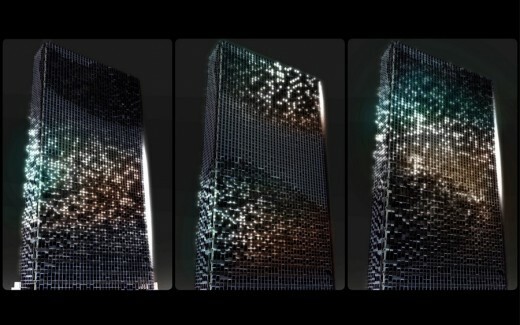 The concept for the animated facade lighting responds to the media activities on Hanbit Avenue. The facade is animated by individual LED pixels, with the lighting reflecting different parts of the building and highlighting areas of activity within. 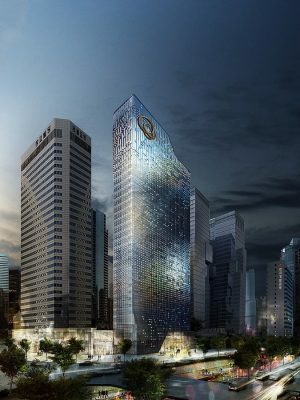 The pixelated lighting references nature, data processing and energy forms and is designed to form part of the overall Hanwha branding strategy with its position as one of the world’s leading environmental technology providers. In response to the request that the design be guided by the surroundings, influenced by nature and driven by the environment, UNStudio developed an integrated responsive facade concept which improves the indoor climate of the existing building and reacts to both the programme distribution and the location. Social well-being is considered fundamental for enhanced creativity and concentration and is driven by several factors, the most significant of which is the improvement of the indoor environment – primarily in order to enhance physical comfort. The existing façade contains horizontal bands of opaque panelling and single layers of dark glass. In the remodelling this will be replaced by clear insulated glass and aluminium framing to accentuate views and daylight. The geometry (pattern, size and reveal) of the framing is further defined by the sun and orientation factors to ensure user comfort inside and reduced energy consumption. In the design for the Hanwha headquarter building the North facade opens to enable day lighting within the building but becomes more opaque on the South façade, where the sun would otherwise have too much impact on the heat load of the building. Openings within the facade are further related to the views: opening up where views are possible but becoming more compact on the side adjacent to the nearby buildings. Direct solar impact on the building is reduced by shading which is provided by angling the glazing away from direct sunlight, while the upper portion of the South facade is angled to receive direct sunlight. 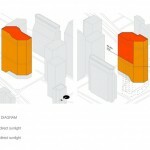 The window to wall ratio is taken into account in order to achieve 55% transparency across the entire facade, while PV cells are placed on the opaque panels on the South / Southeast facade at the open zones where there is an optimal amount of direct sunlight. 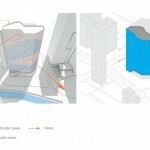 Furthermore, PV panels are angled in the areas of the facade where energy from the sun can best be harvested. The basis for the facade expression is to achieve an effect of variety, irregularity and intricacy throughout the facade. This is approached by combining a system of multi-scaled elements in a simple fashion and is additionally informed by the programme. By varying the placement of the facade panels a variety of programme-related openings are created. Variations in programme therefore create the opportunity for differentiation, with the result that the restaurant, the executive room, the sky gardens, the seminar spaces etc. are all expressed in the facade. In UNStudio’s concept for the lobby of the Hanwha headquarter building the landscape continues into the interior and acts as a guiding aid, while natural materials and planting provide a relaxing environment for visitors. A subtle colour scheme is combined with wooden furnishing and in both the North and the South entrance lobbies a coffee corner creates the possibility for social interaction and exchange. Hanwha Group, founded in 1952, is one of the Top-Ten business enterprises in South Korea with 51 domestic affiliates and 109 global networks in three major sectors: manufacturing and construction, finance, and services and leisure. Putting strategic emphasis on renewable energies as its future growth engine, Hanwha Group has made successful advances in solar energy and positioned itself at the forefront of the global photovoltaic industry. Hanwha Group is the world’s third largest photovoltaic producer with an annual cell production capacity of 2.4GW. Program: Renovation of facade, interior of common spaces and lobbies, meeting levels including auditorium and executive areas, redesigning of the landscape. Competition phase: Ben van Berkel, Astrid Piber with Ger Gijzen and Sontaya Bluangtook, Shuang Zhang, Luke Tan, Yi-Ju Tseng, Albert Gnodde, Philip Knauf. Internal consultants: Martin Zangerl and Juergen Heinzel.